SageGlass dynamic glass was chosen for its ability to prevent heat gain and glare to create a comfortable work environment for all employees. SageGlass®, the world’s smartest electrochromic glass, was installed at the National Institute of Industrial Technology (INPI) in Courbevoie, France. Designed to provide employees with optimal working conditions, the office will feature approximately 15,000 square feet of SageGlass, a product of Saint-Gobain, on the façade of the building. SageGlass dynamic glass was chosen for its ability to optimize daylight, outdoor views and comfort while preventing glare, fading and overheating to create an environment conducive to the success and productivity of the office’s 550 employees. SageGlass was also chosen for its ability to reduce energy demand and the need for HVAC by allowing sunlight in on cool days and blocking it on hot days. The installation was well aligned with INPI’s dual corporate social responsibility approach to care for the environment while enhancing employee comfort. As a result of the SageGlass installation, employees are now able to adjust the tint of the windows in conference rooms for presentations as well as enjoy unobstructed views of the outdoors without the glare on laptop screens. The SageGlass dynamic glass installation at INPI serves as an example of SageGlass’ growth in overseas markets, including Europe and the Middle East. 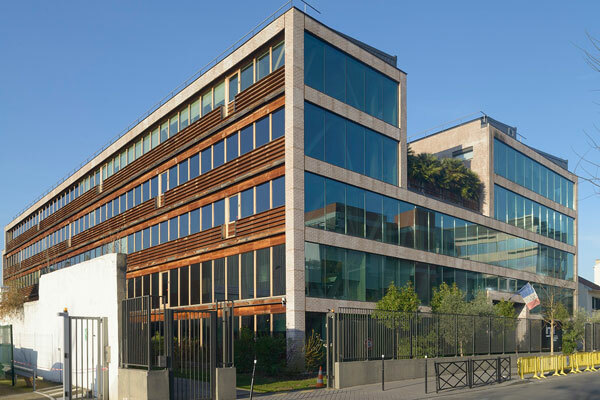 INPI is one of the first buildings in France to feature SageGlass.